I came to Ragout late. Since it opened everybody already paid them a visit, wrote a review and told friends. I spent all this time on the other side - reading, listening, watching them at Afisha Eda food feast before I finally couln't wait any more. I came for lunch. It is not at all a lunch distance from my work, so I spent just a little bit more than one hour (you know what I mean). And I loved the place. I do think Ragout did a great job on their website. Pictures of the food are everywhere and they just blow your mind away. Even more importantly, the pictures materialise when you actually come and order. At least it definitely was the case with me. I came on Friday afternoon. The cafe was half full and I got seated though I didn't do any booking. I enjoyed looking around. Everything there - interior, tables, waiters and guests - looks pretty. I'm normally sceptical about lunch menu offers of any kind. At Ragout though I ordered exactly from there. The lunch offer there seems to be just a selection from the main menu, which still gives quite a wide choice. Even if you are looking for vegetarian food. I ended up picking two pumpkin dishes. Pumpkin soup with green apple and curry came first. Flavorful, with smooth creamy texture. Crispy toasted sunflower seeds were making a good contrast. It was served with a brioche along. The brioche felt warm to fingers. I tasted it - unfortunately it wasn't freshly baked, just warmed up. However it turned out to be a cheese brioche, and it was not bad at all. Pumpkin fried with mushrooms, brussels sprouts and potato sauce looked really pretty. 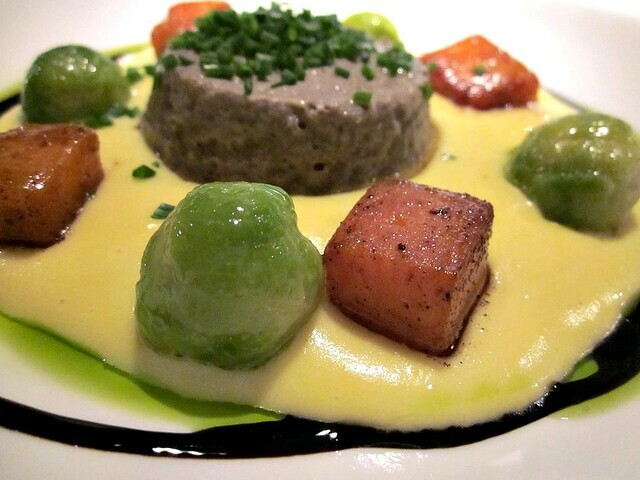 The mushrooms were in the middle in the form of something resembling very tender pâté. The potato sauce tasted really good and complemented the vegetables well. Pumpkin was sweet and crunchy - just lightly fried, so that it stayed almost raw inside. I didn't identify what the dark brown sauce was made of, but I wouldn't want to let it out of the dish. Finally I had to wake up and run back to work. What I paid felt like something too small for the quality of food and service. But that's the thing about lunch, right? I liked it so much that a week later three of us came for dinner. Evening time it was even more pretty. We couldn't help ordering the pumpkin again, but that was after two amazing appetizers. Hummus & falafel with crispy cheese chips. Every time I taste falafel it is different. This one was very silky and creamy inside, crispy on the outside. 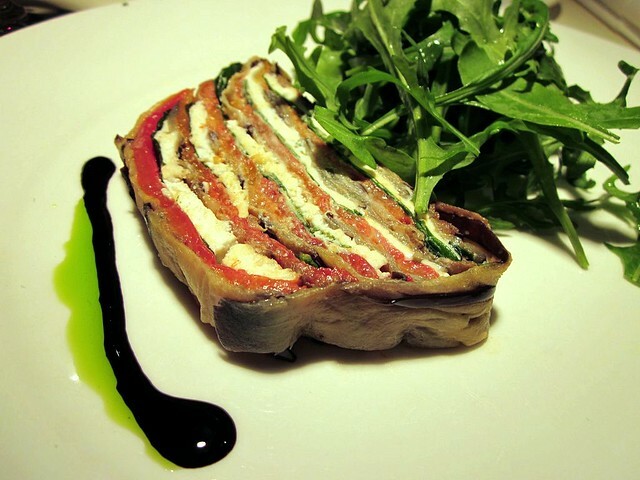 Goat cheese, eggplant and pepper terrine. That felt very pure, delicious due to simple delicious ingredients. For the main course my mom went for these cow cheeks and said they were very good. If you ask me, I'd definitely go for these caramelized baby onions on top of them. I chose these lentils with gorgonzola, cooked risotto-style and couldn't help finishing them. They really echoed risotto though there was not even a hint of rice in there. Just extra tender lentils in creamy gorgonzola sauce. This rye bread sorbet I already tried at Afisha Eda food feast. It is just unbelievable how much harmony it has, given it's flavor hardly ever associated with dessert. The other scoop was beet sorbet, also wonderfully pure and intense. So was this passion fruit sorbet served with fresh pineapple, which doesn't need too many of my comments, given the picture. It feels so good that there is such a place in Moscow. Бокал с вином красиво получился. Yes, it has a real California feel to it!